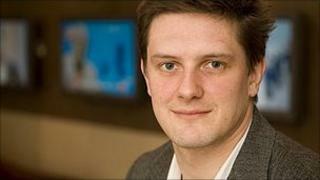 Zai Bennett, the director of ITV's digital channels and acquisitions, has been named the new controller of BBC Three. The 36-year-old replaces the outgoing Danny Cohen, who was appointed the new controller of BBC One in October. Controller of ITV2 from 2006-9, Bennett took on responsibility for ITV's other digital channels in April. He said he was "delighted" to join BBC Three, adding the channel was "on fire at the moment". Under Bennett's stewardship, ITV2 has had successes with original shows including Secret Diary Of A Call Girl starring Billie Piper, Katy Brand's first comedy show, Celebrity Juice with Keith Lemon and The Only Way Is Essex. Director of BBC Vision Jana Bennett called him one of the "most energetic and creative leaders working in television today". "His experience in developing original scripted drama and comedy, along with his fantastic relationship with presenters and performers, makes Zai perfect for this role," she added. The BBC said Mr Bennett's start date would be announced shortly. Meanwhile, it was also announced Fun Lovin' Criminals singer Huey Morgan will be hosting a new weekly show on Radio 2. From April, he will present the Saturday morning 0000-0300 slot playing an eclectic mix of music from the past 60 years. Morgan, who has been covering Lauren Laverne's maternity leave on her weekday show on 6 Music, also has his own Sunday afternoon show on the same station which he will continue to host. "It's a huge honour to be given three hours a week to kick back and play some of the hottest tunes, both new and old, with a disregard of genre," Morgan said. "Growing up in NYC, I could never have imagined that the prestigious and world famous BBC would give me six hours of airtime a week to play my favourite records, and allow me chat to some of the people who have inspired me along the way." Bob Shennan, Controller of Radio 2 and 6 Music, said: "Huey has earned his presenting stripes on 6 Music and his appointment clearly demonstrates Radio 2's fierce commitment to producing a network full of the most diverse music programming available today on UK radio."